A to B to Sea: On the hard! One of the huge jobs that had to happen before we could leave was to take the boat out of the water (in marine speak: put it on the hard). 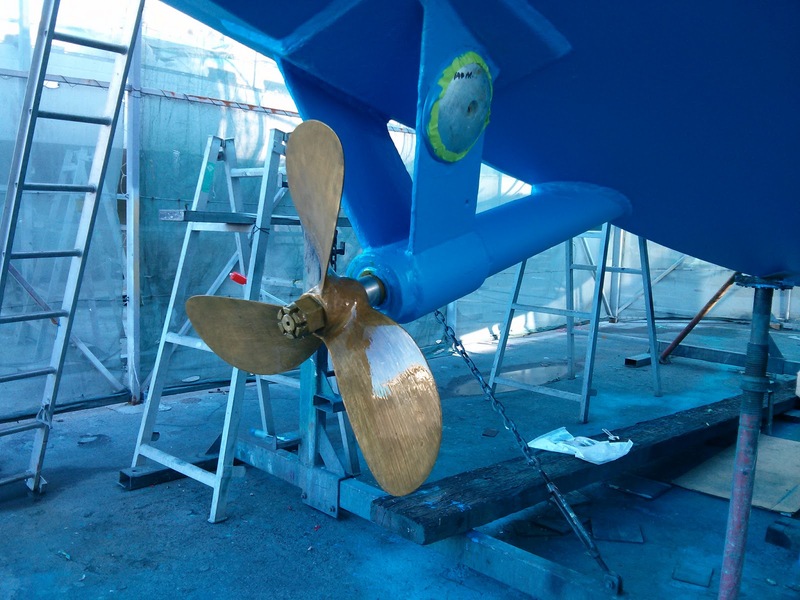 The primary purpose was to have under the waterline anti-fouled (painted with really expensive paint that inhibits marine growth) but we also needed to have a few other things checked out. The whole process of lifting a boat out of the water was fascinating to me. Motoring the boat down to the boatyard was also the first time that I was on Aquabat while she was mobile (Bryce had done a test sail before we bought her), so it was all very exciting! From the beginning it seemed as though people only had bad news for us! We were told the mast was crooked. It's not, thank goodness! The boat was just sitting at a 2 degree angle but it still had us worried for a bit! The biggest problem that they found (Surprise!) was a rather large hole in the rudder. It was able to be fixed but when they removed the rudder from the boat they found more corrosion on the shaft which also needed to be repaired! Both Bryce and I learned so much during this time! The next time the boat gets anti-fouled, I will be doing it so I picked the painters brains about how to do everything! Timing, technique, brushes, paint, the works! Bryce was able to spend time with the mechanical guys to see how everything in that department functioned as well as how to fix any problems that might come up! After sitting in the water for awhile and not going anywhere, the bottom of the boat was a bit of a mess but they cleaned her up quite nicely! 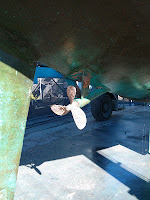 Here are some before and after photos of the anodes and the propeller! 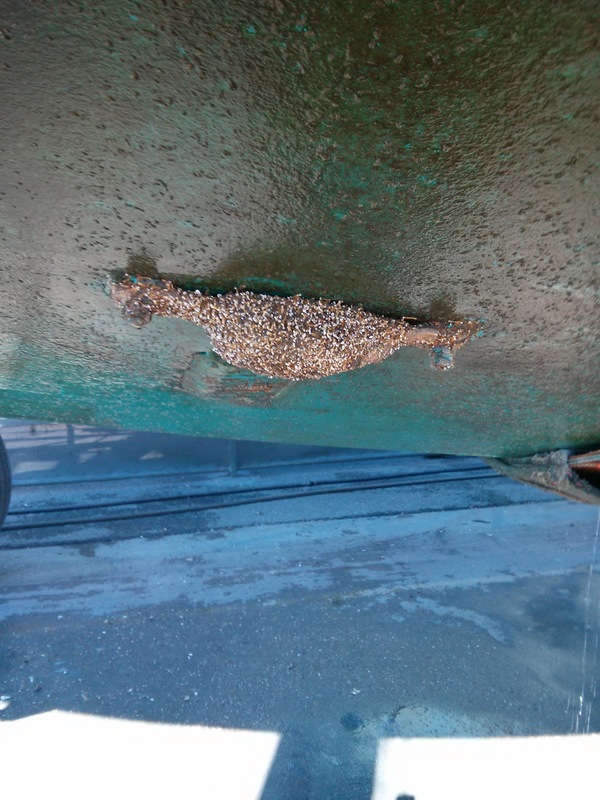 You can also see how much algae was growing on the bottom of the boat! Everyone that worked on the boat was absolutely wonderful and so generous with their time and knowledge! 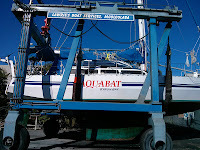 The guys at Ashby Boatbuilders were the ones that did the most work on the boat, though there were definitely others in the boat yard who played an important role in advising us and fixing our problems! Toby at Navsafe Marine was particularly invaluable! We had contracted Toby to do a survey on Aquabat before we bought her and he very generously made himself available for us during this time. He was so helpful in problem solving and doing everything that he could to make sure that Aquabat is the best boat she can be! Both Bryce and I would highly recommend his services to anyone needing them. In the marine world, Toby is definitely someone that you want on your side! One of the nice things about having the boat out of the water was that it gave us our first opportunity to actually stay on board. Up until now we had been driving an hour every day to get to the boat. 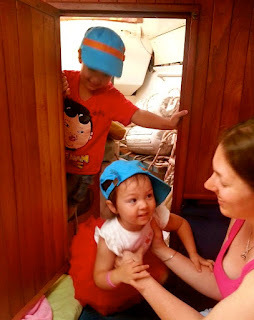 It was definitely a modified version of what it will actually be like when we move in and sail off but it was still fun to get a taste of what it will be like and we found that we were much more productive when we could just get up and get to work right away!! 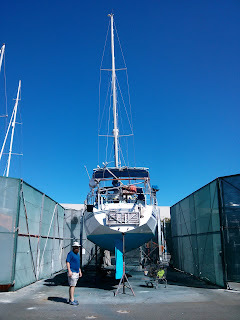 We didn't have any water on board, the gas alarm didn't work, the toilet was broken, the electricity source was a bit dodgy, and we had to climb up and down a ladder to access the boat (much more of a pain while carrying things as well). We were able to cook a few meals on board before we found out the gas alarm wasn't functioning! These things will all be fixed in the coming days and we will hopefully be able to take off soon! Our to-do list seems to be growing and while we are trying to keep it under control we realise that there will always be things to do! 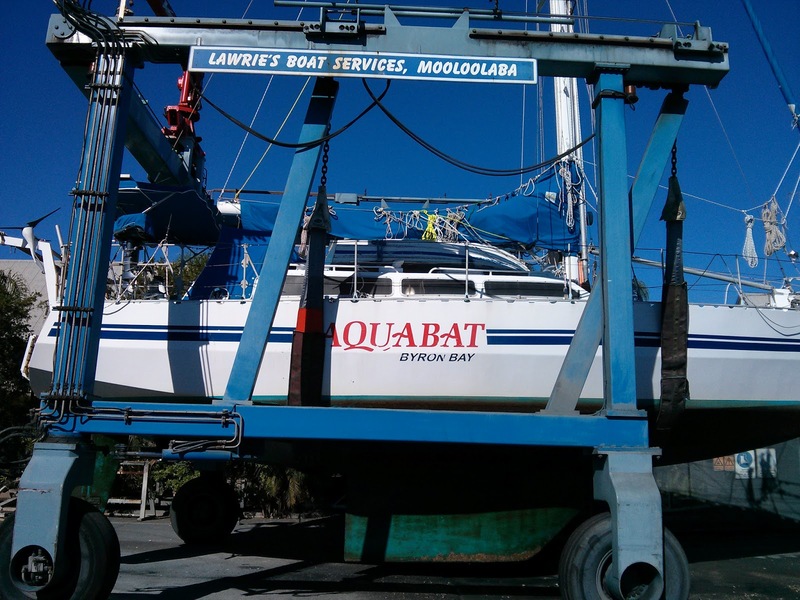 The boat was previously registered to and labelled as being from Byron Bay. 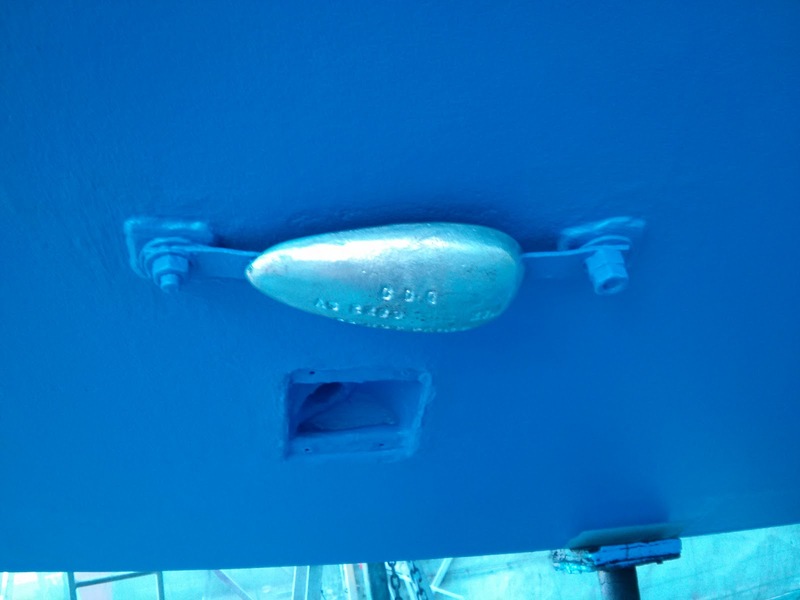 In changing the registration to Brisbane, we needed to change the city signage on the boat. Now, in discussing this, when Bryce said "Alissa, do you want new lettering for the name of the boat as well? It's up to you," he did not tell me that I would be the one spending a week painfully scraping off all of the old vinyl lettering. If he had have, we might not have the beautiful new lettering that we do now. I now know that a heat gun apparently makes the job a bit easier but really hope I never have to try again! 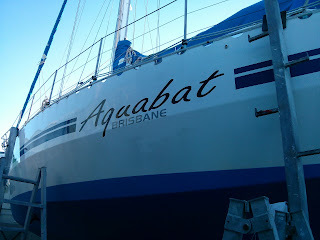 Changing the signage was definitely not a necessity but it gives the boat a fresh, new look that is ours! We hope to be heading up north in the near future. In the meantime, we are trying to spend as much time as we can with friends and relatives and there is always work to be done on the boat! Well, you two seem to be having a great time preparing for your trip. 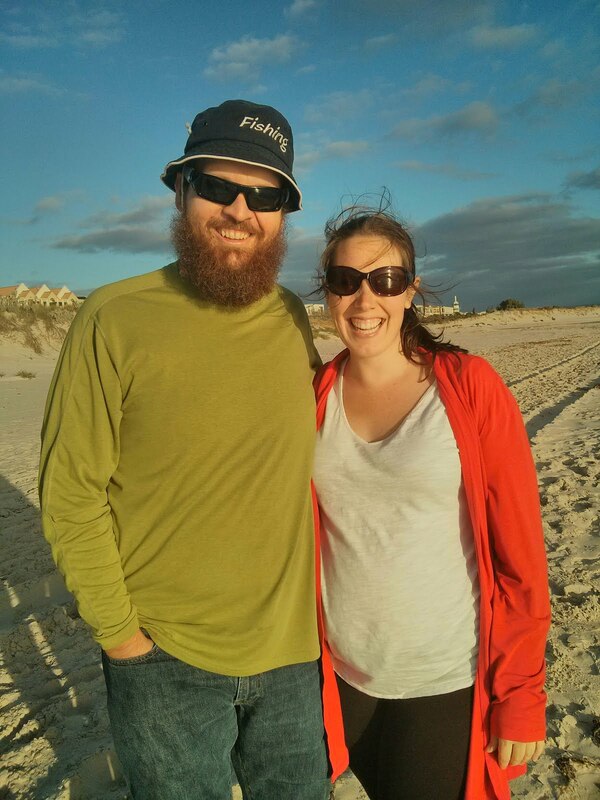 I love the idea and can't wait for more pictures and stories as you travel around the world. Until next time. new letters look great--making it your own!